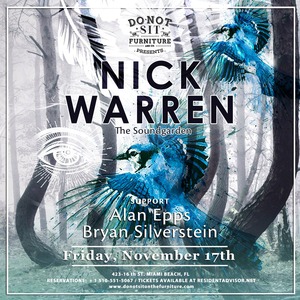 Friday, November 17th, Do Not Sit On The Furniture presents Nick Warren [ Hope Recordings / The Soundgarden} www.facebook.com/nickwarrenhope Support by: Alan Epps Bryan Silverstein The term “internationally known” or “world renown” is a loosely used term these days. Not too many artists actually can say they are respected all over the world or known across every continent or country on the planet. Nick Warren is one of the few who has managed to make himself known across the globe. He has been showcased in nearly 50 countries and even in obscure countries such as Jordan and Lithuania. He’s always able to put together top-notch mixes infused with atmospheric mastery, breakbeat magnificence, and experimental brilliance.